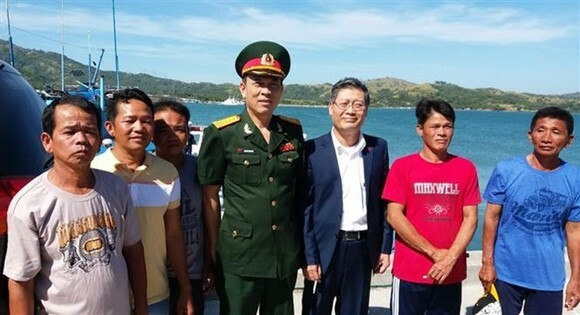 The Vietnamese Embassy in the Philippines and Philippine agencies on November 29 held a ceremony to send five Vietnamese fishermen and one fishing boat from Phu Yen province back to Vietnam. The send-off ceremony was held at Sual port of Pangasinan province, 350km north of Manila capital city, with the participation of Philippine President Rodrigo Duterte and local authorities. Duterte said that the Philippine Government has completed procedures to send the fishermen back to Vietnam, in accordance with the request of Vietnamese leaders. For his part, Vietnamese Ambassador to the Philippines Ly Quoc Tuan thanked the Philippine President and agencies for helping the fishermen return home. The bodies of two other fishermen from the boat were brought back to Vietnam on October 7. Vietnamplus.